Strangely enough, Michael Jackson was an influential force in leading Amy Gahala to her career path in hydrology. Years later, after the birth of her son, she saw Al Gore’s “An Inconvenient Truth,” and she knew she wanted to do something that would help save the world’s resources. In researching colleges, she found that NIU was one of the only colleges in the area to offer a science-based degree that included environmental studies. Not only did NIU have the program, but it also had the prestigious faculty to go with it. “Professors such as Dr. Reed Scherer, Dr. Ross Powell and Dr. Eugene Perry have done work that is renowned among the scientific community, and their research is some of the most heavily cited,” Gahala said. Knowing she would be learning under faculty members who are also working on innovative research made NIU her top choice. 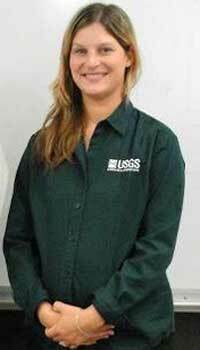 As a scientist with the USGS, Gahala has put her field experience at NIU to practical use. Gahala is also working with the Environmental Protection Agency (EPA) to aide regional project managers in reviewing documents and reports pertaining to Superfund sites in the Midwest region, once again putting to use the knowledge she gained in the field. Recently, Gahala returned to campus to complete HAZWOPER certification required by the EPA. The training was made possible by her former adviser, Melissa Lenczewski. “Dr. Lenczewski was influential in passing on her ‘out of the box’ way of thinking to me and my career,” Gahala says. Lenczewski’s guidance, and the knowledge Gahala gained from Colin Booth in hydrology and hydrologic modeling, has led to the life she envisioned, back when she was listening to Michael Jackson.